This week we look at TUI AG and its various cruising arms – the TUI Cruises joint venture with Royal Caribbean Cruises and its wholly-owned Hapag-Lloyd Cruises and Thomson Cruises brands. Elsewhere, Quito-based Metropolitan Touring will soon take delivery of the stabilized Santa Cruz II, its most luxurious ship yet. And MSC Cruises has now claimed the number one spot in terms of capacity offered in Europe. Some people ask why Germany has surpassed the UK in terms of passengers carried with 1.7 million last year to the UK’s diminished 1.64 million, down from 1.7 million in 2013. The answer has three initials – TUI, which used to stand for Touristik Union International but is now a brand on its own. Hanover and London-based TUI AG, with shares listed in London, is continuing a relentless expansion into the German cruise market that adds up to the introduction of eight large cruise ships in a decade and is now spreading to the UK as well.. Starting with two former Celebrity ships, Mein Schiff 1 (ex-Galaxy) in 2009 and Mein Schiff 2 (ex-Mercury) in 2011, TUI Cruises went on to build new ships, with its 2,506-berth Mein Schiff 3 delivered in May 2014 and Mein Schiff 4 this year. Sister ships Mein Schiff 5 and 6 are set for delivery in June 2016 and early 2017. The latest orders will add two slightly larger ships, the 2,860-berth Mein Schiff 7 and 8, in 2018 and 2019. At that time, if not earlier, it is expected that Mein Schiff 1 and 2 will be extracted from the TUI Cruises joint venture and allocated to Thomson Cruises as part of a UK fleet modernisation program that will see many more balconies added to its inventory. With Hapag-Lloyd Cruises, meanwhile, TUI focuses on luxury and expedition products. Hapag-Lloyd left the premium market that it once exploited with the 420-berth Columbus and then the 684-berth Columbus 2 when the latter was redelivered to Oceania Cruises as the Insignia last year. Hapag-Lloyd now concentrates exclusively in the ultra-luxury sector with its 408-berth Europa and 516-berth Europa 2, in its third season of operation, and in the expedition market with its Bremen and Hanseatic. Europa 2 and Hanseatic engage in the international market while Europa and Bremen concentrate on the traditional German-speaking market. As the German cruise market continues to grow, TUI Cruises has recently converted its options for Mein Schiff 7 and 8 into firm orders, with delivery expected in 2018 and 2019. All newbuildings for TUI Cruises have been built at the Turku shipyard once operated by STX but now owned by Papenburg-based Meyer Werft. 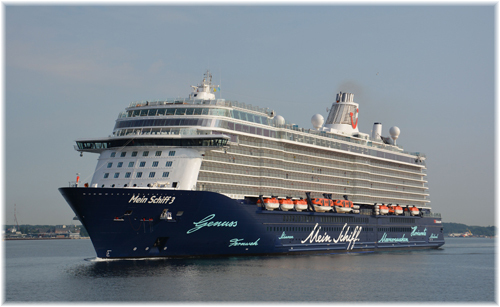 Mein Schiff 7 and 8 will be slightly larger than their predecessors, with 2,860 lower berths. When the latest pair are delivered it is expected that Mein Schiff 1 and 2 will be moved to Thomson Cruises, upping Thomson’s balcony inventory in the UK market. In the meantime, the delivery of Royal Caribbean’s Splendour of the Seas as Thomson Discovery in the summer of 2016 will add 355 balconies to the Thomson fleet, where they have been a relative rarity in the past. When they are transferred in, Mein Schiff 1 and 2 will bring another 600 balconies to Thomson, making it more of a contender in today’s contemporary market. Although also part of TUI, we do not include here Toronto-based Quark Expeditions or Seattle-based Zegrahm Expeditions, which between them usually have on charter four or five expedition ships, mostly taken on a seasonal basis. The various TUI fleets will soon add up to almost 30,000 lower berths, although it is likely that the return of two of the chartered Thomson ships to their owners will bring this to about 28,000. This is still an important number, however. 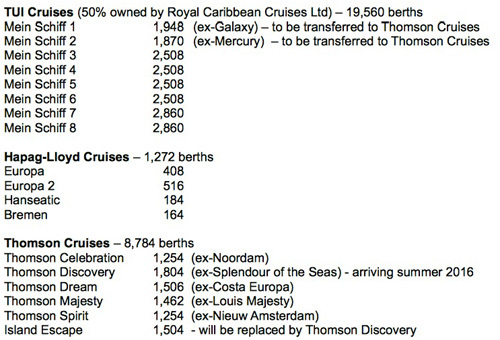 P&O Cruises’ UK fleet, for example, at 16,205 lower berths, numbers about 40% fewer than that. 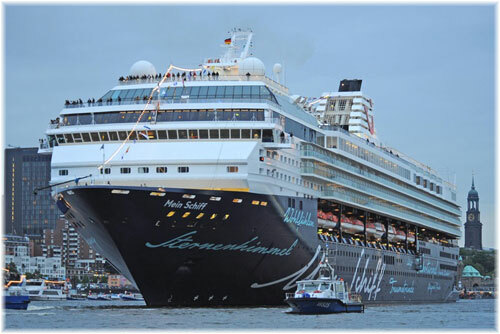 Mein Schiff 1 and Mein Schiff 2 will be transferred in from TUI Cruises when new ships are delivered, at which time two of the above chartered ships will likely be returned to owners. Metropolitan Touring, the company that pioneered expeditions to the Galápagos Islands in the late 1960’s, has announced the launch of its newest expedition vessel, the 100-berth Santa Cruz II. Scheduled to take over from her legendary predecessor, the 90-berth Santa Cruz, on October 5, the Santa Cruz II will bring with her a new way to explore the wonders of the Galápagos Islands in style and comfort. While the first Santa Cruz had been designed to cruise the Galapagos and was custom-built for Metropolitan Touring in 1979, the stabilized Santa Cruz II brings with her a higher level of comfort. The rest of the fleet consists of the 48-berth La Pinta, introduced in 2008, and the 40-berth Isabela II, converted in 1988. Both were adapted from previous uses. Although Metropolitan Touring was founded in 1953, it did not turn its attention to the Galápagos Islands until the late 1960s, when it became the first company to promote foreign visits to those islands. At first, these took the form of day tours on flights from the mainland, and then, from December 1969 onwards, aboard the company’s own 60-berth yacht, the Lina A, which had been cruising in Greece for a company called Holiday Lines. The Galápagos National Park had been created in 1959, but organized visits were rare and unregulated, so together with the authorities, Metropolitan Touring’s first guides set down the rules that are still in force today. 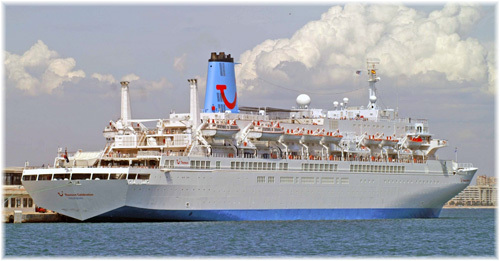 The success of the cruises aboard the Lina A led to Metropolitan Touring purchasing another ship, this time in Canada. Formerly the Clarke Steamship Company’s passenger and cargo ship North Gaspé, she was purchased in 1972 from owners in Nova Scotia. Converted in Guayaquil, she then became the 70-berth Iguana. Metropolitan Touring then sold the Lina A and in 1977 acquired the 16-berth yacht Isabela in the United States, refitting her for small groups, private charters or families. The Isabela II, which was converted at Pensacola, succeeded this vessel in 1988. When the Santa Cruz entered service in 1980, the Iguana became the regular supply ship, running bimonthly between Guayaquil and the islands. At this time she came under the ownership of Fausto Aguilera, a relative of Christina Aguilera. Christina was born in New York just a few weeks after this photo of the Iguana was taken at Guayaquil. Metropolitan Touring’s latest acquisition, the Santa Cruz II, was built in Chile in 2002 for Cruceros Australis, for whom she sailed the Chilean fjords as the Mare Australis. Her cabins are 160 sq ft, all outside and en suite, and feature panoramic windows. The Santa Cruz II is now undergoing final refit in Guayaquil before re-entering service, when she will operate 4-, 5- and 9-night itineraries in the Galápagos. The Cruise Industry Information Report 2015-16 has recently identified MSC Cruises as the largest cruise line in Europe, in terms of capacity, offering berths for 1.1 million passengers. MSC Cruises, which claims to be the world’s largest privately owned cruise line, also has important positions in the South American and South African market, where it operates in the winter. MSC has expanded its cruise capacity by 800% percent in its first decade, becoming the fourth largest business in the cruise sector, after Carnival Corp & plc, Royal Caribbean Cruises and Norwegian Cruise Line Holdings. But where for years Costa Cruises claimed this prize, it has been busy developing the Chinese market for parent Carnival Corp & plc, where Costa Asia will soon have four large cruise ships and MSC is not active. MSC’s present newbuilding activity includes a $5.5 billion investment plan for seven new ships in two classes to be delivered between now and 2022. MSC Cruises has more recently been in the news for offering free water to North Americans cruising in Europe while asking Europeans to pay.